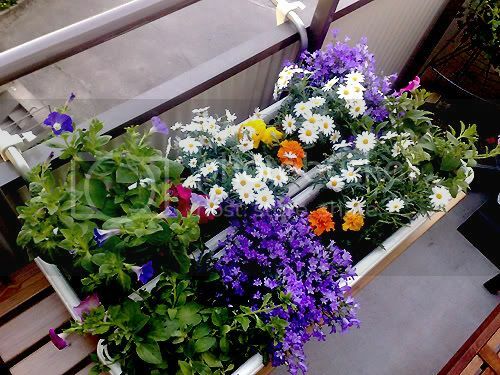 and this is what 13 plants crammed into two balcony boxes look like... hehe. aren't i clever to load up the balcony with 40 plants (yes, i've counted) a few days before going on a 4-night trip to london? especially since i'm then making another 4-night weekend trip to london next week again? hehehe. S-M-R-T! eh, i don't care. i have a pretty baaalcony. now if only i could spend the day out there. i'm staying home from work - have a cold and fever and need to try and nip it in the bud before the trip. have way too much work to do to be home more than one day. meh. maybe i'll keep updating my flickr account. i haven't used it since 2006, heh. but then i realized i've amassed almost 800 photo's on my mobile phone since late november. i need a photo-outlet. ta-da! hmm, let's see if i can get the e-mail function to work... hehehe. 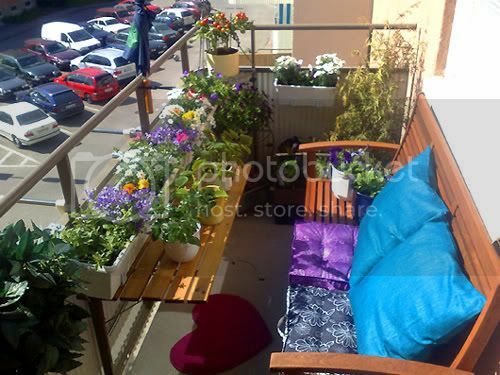 your balcony is so cute! it reminds me very much of a balcony one of my friends had in college...very similar shape and furniture, and it was always lovely being outside on it during her parties. i hope you get lots of enjoyment out of it! i will reply to your email soon! this evening!